Hashtags are used on social media channels and are important in your business – you may be missing a trick if you’re not using them. …if you use the wrong ones, you need to get off that path you are driving down. First… let’s talk about what hashtags are and why you need them! A way of making you look stupid when you include irrelevant hashtags! Hashtags are a great way of grouping a related conversation together on social media channels. For example, you might be at a conference and there is a hashtag for the conference. You can filter out the conversation to engage with people at the conference, promote your products/services using the hashtag and more. But if you use too many hashtags – or the wrong ones – that is not going to help you get the additional exposure you want. What platforms do you use hashtags on? Twitter – Very popular on Twitter and well worth using. Use no more than two hashtags for any tweet and try not to use really broad hashtags (e.g. #sport). Instagram – You wouldn’t leave home without your umbrella in Ireland and you shouldn’t share Instagram posts without some hashtags! Instagram is where hashtags are used the most. Facebook – When you come across a hashtag on Facebook, you can click on the hashtag and view a filtered list of updates that include that hashtag. However, hashtags are not used that often. I recently came across a post with a hashtag related to an event and when I clicked on it, I saw a lot of updates related to the event. This was useful but, as hashtags are not always considered on Facebook, you are probably only capturing a very small percentage of the conversation on Facebook. Pinterest – They are clickable within pin descriptions but not searchable. Google+ – When you click on a hashtag, you see a list of communities, people and posts relevant to the hashtag. 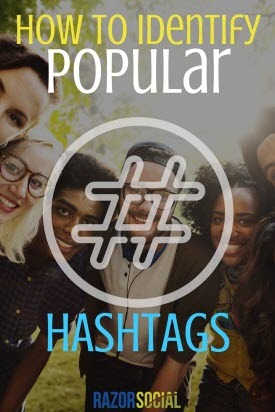 The most popular hashtags are not always the best ones to use because there are so many people sharing content using that hashtag. It’s easy for content to get lost in the rush when there are an overwhelming number of posts! So you don’t always want to pick the number 1 most popular hashtag on the list! This analyzes hashtags across Twitter to find popular/trending hashtags and can then automatically add these hashtags to tweets or Facebook updates when you are sharing. This automation saves you time with each post, and Ritetag has a Chrome extension to make this easier. It can also integrate with Buffer, Hootsuite and Sendible as well as Facebook and Twitter. With Hashtagify.me, you can enter any hashtag and it will give you a selection of related hashtags to use in your updates. 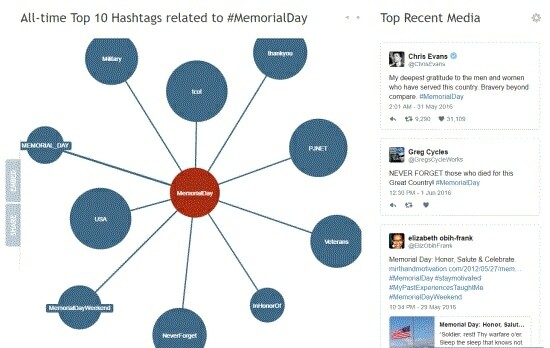 Here, hashtags related to #MemorialDay can be seen in a visual format, along with some recent tweets using the hashtag. You can use these suggestions to make sure you cover a range of hashtags and not just the most popular ones. Twitonomy is a useful tool that analyzes a person’s account to see which hashtags they use the most often. This can be one of the easiest ways to find relevant hashtags. Find someone popular in your niche who uses hashtags a lot and start using some of their hashtags. Make a list of your competitors or influencers and analyze their accounts with Twitonomy. You’ll find that there are some common hashtags that start appearing. 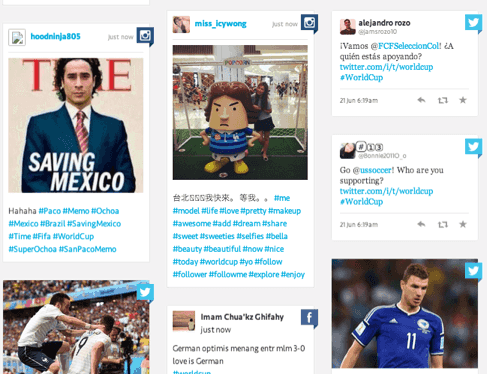 Tagboard is a search tool for hashtags across multiple platforms. You enter in a hashtag and it displays a board of content that has that hashtag included. This is useful to see which other platforms are using a popular hashtag you are sharing, and you can see the most popular content related to the hashtag. Iconosquare is an Instagram tool that allows you to search for hashtags on Instagram and see how many times each has been used. This lets you work out how popular a hashtag is on the site. You can also click on ‘Top tags on Instagram’ to find out which hashtags are trending that you might want to hop onto, as long as they are relevant to your posts. There are some platforms (e.g. Twitter) that show what is trending on the platform at the moment. If it’s relevant to your business (or you can make it relevant! ), jumping on the back of a trending hashtag could be useful. Hashtags can be quite useful to get extra reach, attention and also to find opportunities to engage. If you use them well, it can be very beneficial to your brand. Which tools do you use? Do you find that hashtags are useful to your brand?